Product information "1300 Years Bulgaria. 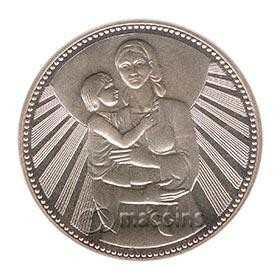 Mother and Child"
The obverse depicted Bulgaria coat of arms. Below is the nominal value of 25 leva. In the outer circle of the coin has an inscription “1300 year Bulgaria” and the year of issue – 1981. The reverse side depicted mother holding a child in her arms and the sun at the background. Related links to "1300 Years Bulgaria. Mother and Child"
Subscribe to the free newsletter and ensure that you will no longer miss any offers or news of Macoins.